Most research projects require both in-text citations and a list of works cited at the end of the project. Download this document to complete the in-class activity. Use this for help citing print books and periodical articles, audio and video recordings, and speeches. Use this for help citing websites, online books and periodical articles, e-mail, and digital files. Use this link from the University of Wisconsin Writing Center for help citing print, media, and online sources. 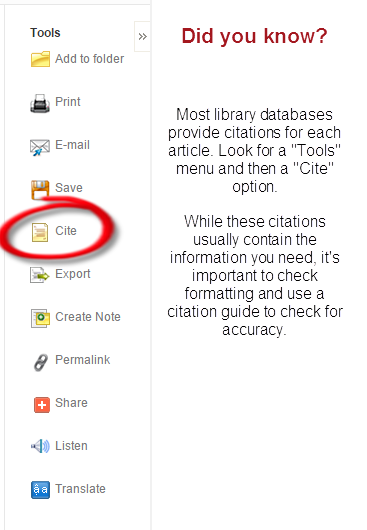 Use this guide for help citing print books and periodical articles, audio and video recordings. Use this guide for for help citing websites, online books and periodical articles, audio and video recordings.